We keep each day as consistent as we can by following the Structure of the Day. This is to help you get into a routine, settle into Rossie and feel safe at all times. We will also make sure that there are lots of fun things to do which you can take part in. We wake you up at the same time on weekdays so that you can keep to a morning routine. If you want a long lie at weekends, that is okay too. Everyone needs a long lie sometimes! We encourage you to have breakfast every morning to give you the energy and prepare you for the day ahead. We have Breakfast Club activities which include dance and trampoline sessions and walking. Doing an activity in the morning will help you become more energised and have a more positive frame of mind for the rest of the day. Once you are awake enough, it is time to shower, tidy your room and get ready for the school day. It is time to go to school. There are 7 class periods with a morning break and 50 minute lunch break when you return to your house for lunch. During classes, you will have support and help for all aspects of your learning. 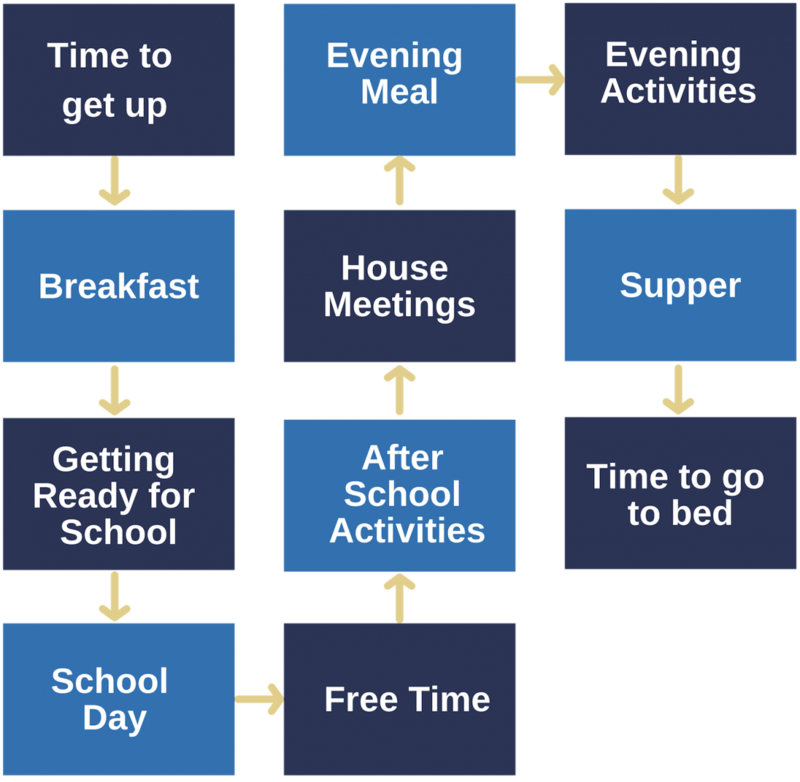 During the week after school, you will have time to do homework, an enjoyable activity, go for a walk, go to the dance studio, go swimming, playing sports in the gym hall or relaxing in your house. Depending on your plan, we can also arrange for you to have ‘home leave’. At the weekend, you will have more opportunity for these fun activities. We offer you extra help with your homework and have study sessions that you are encouraged to go to. If you need help with your studies, or making something to send home to your family, or if you would like to chat about something, we are here. You can get involved in our Youth Club, where you can help plan after school activities for the next few weeks. Activities are fun and sociable and range from quizzes and arts and crafts, to playing football and making music. Once a week, each house has a meeting to discuss what has been happening in the house, to share ideas and make suggestions about things you would like to change or improve. These meetings also let you raise any concerns or worries you may have which we will put right. You will enjoy an evening meal with staff and other young people in your house dining room. This is also a time for you to chat with staff and other young people to tell them about your day. Healthy and nutritious food is prepared in the Rossie kitchen by our chefs. We also sometimes prepare food with you in your house kitchen, as long as we know it is safe to do so. Depending on what you and the other young people want to do, we can do a mix of activities. Usually, young people like to do something active like go swimming or play pool. If your plan says you can have access to the community or home leave, that can be arranged. If you would rather relax, play the games console or watch a movie, that is fine too. Do not go to bed hungry, it has been a long day! We encourage you to have something to eat before putting your head down for the night. The time you go to bed depends on your age. We wait a while for you to settle down – you may want to do some reading or watch a movie. We then we switch the power off so you can get to sleep! We know that sometimes getting to sleep can be difficult because it’s a time when you think about not only the good things, but also the not so good things that happened before you came to Rossie. You may want to do some reading or watch a movie to distract you from these thoughts. Remember that watching TV screens can affect your sleeping so, we will help you find the right balance by providing set times to switch off bright lights from TV screens and in your room.